Learn how Lay’s potato chips increased sales by using crowdsourcing to ask their fans to do them a “flavor”. Cappuccino, Wasabi Ginger, and Mango Salsa flavored potato chips… has Lay’s lost its mind? 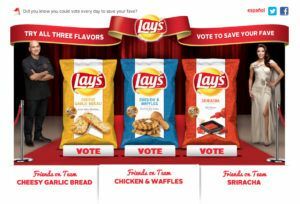 No, in this smart marketing play, Lays has used crowdsourcing to encourage less-engaged millennial customers to dream up new flavors and vote for their favorites. Lay’s started the competition in 2012 and has seen great results. 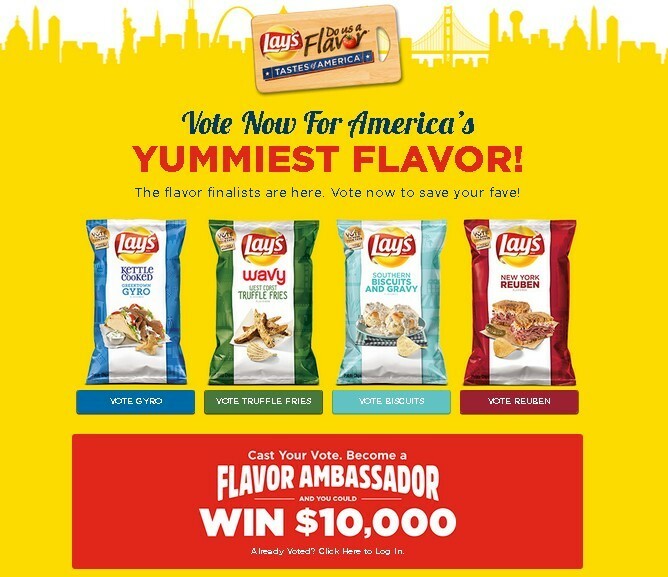 Fans can submit flavor ideas on Lay’s Facebook page and the winning flavor will win $1 million or 1% of the chip flavor’s sales for that year. In this campaign, Lay’s is creating value by driving traffic to their Facebook page and making the previously declining brand, a very relevant topic of conversation for their target millennial customers. Beyond building brand equity, this creates value by producing new chip flavors that might not exist otherwise. These creative flavors have become fan favorites, driving Lay’s sales up and serving new customers. In its first year, for example, the winning chip flavor, Cheesy Garlic Bread, drove an 8% sales increase for Lay’s in the three months following the competition. Value is created for consumers as they have a new fun activity in brainstorming flavor ideas and feeling like they are contributing to America’s favorite chip brand. Finally, this successful program sets an example for other struggling CPG brands searching for a way to connect with customers through crowdsourcing. Lay’s captures value by enjoying increased sales and positive brand equity. 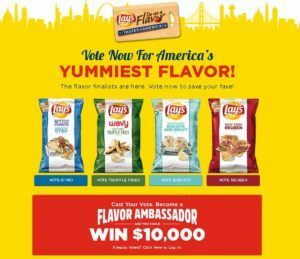 In 2014, Lay’s received 14.4 million flavor submissions and ad recognition and purchase intent both increased during the campaign. However, as Lay’s enters its sixth year of the Do Us a Flavor campaign, the company must be creative in maintaining customer engagement and excitement about the submission and voting process, as well as actually purchasing the new flavors. Reports of fake submission ideas have flooded the website over the years as flavor ideas like “7th Grade Locker Room” make it to the top of the site. 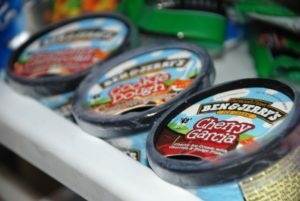 Additionally, as the brand produces more of these flavors, they must continue to innovate and find new creations that are delicious and receive high customer ratings. 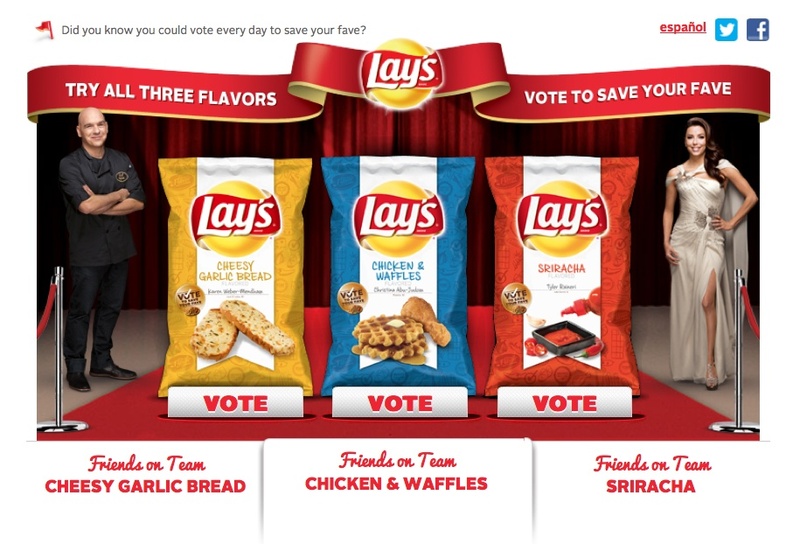 Lay’s has evolved the competition over the years and in 2015 took steps to turn the submissions into a two-way conversation with fans. Partnering with digital shop, Deep Focus, the brand listened to customer conversations on twitter and created funny response videos on YouTube to react to their comments. Set in a puppet show theme featuring two potatoes, the Taste Spuds, Lay’s uses this medium to further engage with top influencers and extend the buzz of the competition. Additionally, the company set up a heat map to track what ingredients of most popular in submissions from each state. Lay’s has enjoyed the success of crowdsourcing in an industry that is not typically driven by the creativity of its customers. Through this competition, they’ve incentivized customers to participate in crowdsourcing with the opportunity to win $1 million, and in return, the company has captured far greater benefits. We will have to watch how Lay’s innovates on the competition in the upcoming years, but with the evolution and speed of digital platforms, the opportunities for Lay’s to strengthen its connection with its customers are endless. It’s great to see a CPG company venturing into the digital space to refresh relevance with consumers. I’m interested to see how long this type of promotion will continue to be relevant. To some extent it’s “giving the people what they want” but I wonder if it crowds out actual product innovation for the brand if this is the main focus. Many successful breakthrough innovations in CPG space were non-obvious with consumers never knowing they needed the product before it existed. Maybe this type of engagement works to build connection with consumers online, where they are, and perhaps generate a few ideas for flavor extensions, but I’m skeptical about how much potential it has for true innovation. Agree with MHS’s point on keeping the consumer engaged as it’s important for Lays not to become a stale brand in the eyes of the consumer. However, more of a vetting process needs to be put in place in order for fake submissions such as “7th Grade Locker Room” (they are lucky that it wasn’t worse!) don’t rise in popularity on their website. A very public scandal with a fake submission could be very detrimental to the brand. Very interesting post, Kat, thanks! In previous examples of crowdsourcing that we’ve seen, such as website design, marketing campaigns, algorithms, etc, the crowd represents an untapped set of experts who can help the client in new, creative ways. 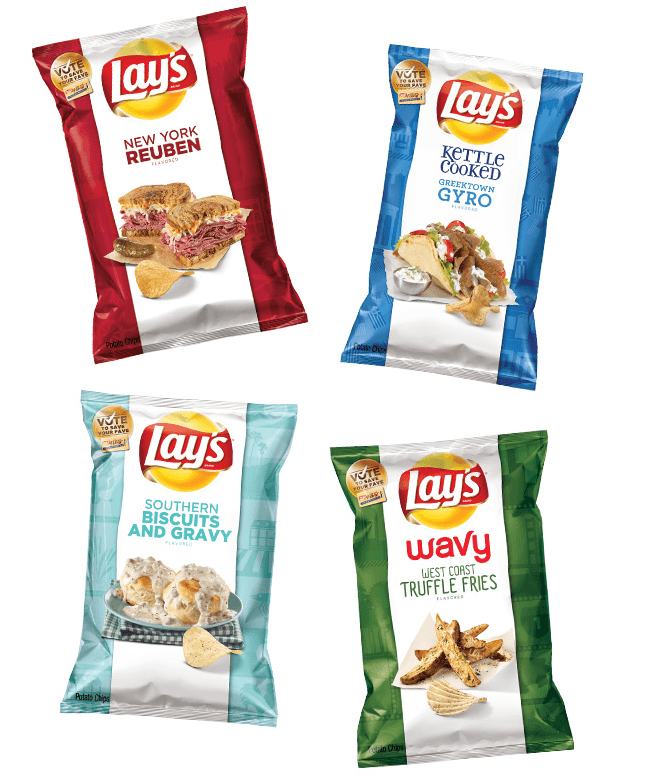 I am interested in how the crowd that Lay’s has tapped into knows what flavor chip they will want Lay’s to produce? I am skeptical — though clearly impressed — about how a crowd of voters at home can predict whether a Cappuccino or Wasabi Ginger potato chip will actually be appetizing. These flavors are certainly interesting (exotic? ), and I understand why they would receive votes – from other non-expert Facebook browsing Lay’s enthusiasts — but should that be enough for Lay’s to give the green light on production? Again, the sales tell all, and clearly the effort has worked over the last few years, but I’d love to hear about how management eventually got on board with this idea. Thanks!